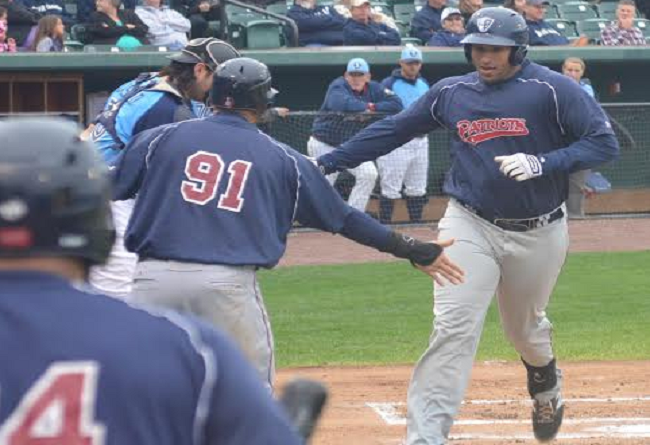 After being delayed on consecutive days due to inclement weather, Game Three of the Atlantic League Championship Series was played on Sunday evening with the Somerset Patriots topping the Southern Maryland Blue Crabs 7-3 to take a 2-1 lead in the best-of-five series. First baseman Matt Fields led Somerset’s offense with a two home run, four-RBI performance. After Aharon Eggleston drew a walk in the first inning, Fields blasted his first homer (2) of the game for a 2-0 lead. Fields went opposite field for his second home run (3) in his next at-bat to give the Patriots a 4-0 advantage. “I came in with an approach and a plan and when you stick to what you planned out, just believe and have faith, everything falls into place. I had a good day. Took a few good swings on some balls and just tried to do my part to help the team win,” Fields said. An RBI single by Adam Donachie in the fourth inning extended Somerset’s lead to 5-0. Eggleston (2) then hit a solo shot in the next inning to give the Patriots a commanding 6-0 lead. “It was good to add on as we went through the game too. That’s a game you need to add on. Since we scored early you need to keep adding those runs to keep the pressure on,” Somerset Patriots manager Brett Jodie said. Somerset starter Matt Zielinski (1-1) stymied the Blue Crabs through six innings before getting touched up on a three-run home run by Keith Castillo (1) that cut the lead in half in the seventh. “[Catcher Adam Donachie] and I were on the same page all day. He called a great game back there. I had really good command of my fastball today. I fell behind a little bit, but I was able to work back and challenge the hitters and get some big strikeouts when I needed them,” said Zielinski. Somerset got an insurance run in the ninth when a wild pitch in the ninth allowed Nate Spears to score for the 7-3 final. Zielinski allowed three runs on five hits and six strikeouts in 6.1 innings pitched for the win. Jon Leicester (1-1) suffered the loss, allowing six runs on seven hits in five innings pitched. “Today it looked like [Zielinski] settled in after about the third and really hit a groove where he was throwing the ball well. His pitch count was a little elevated; I left him in there. He really wanted to keep the ball and he was throwing well. I know what I have in him so we left him in there. He really threw a great game and did a great job with the lead, which is huge,” said Jodie. The Game 4 of the 2015 Atlantic League Championship Series will take place on Monday evening in Southern Maryland at 7:05 pm. For more information visit www.somersetpatriots.com.